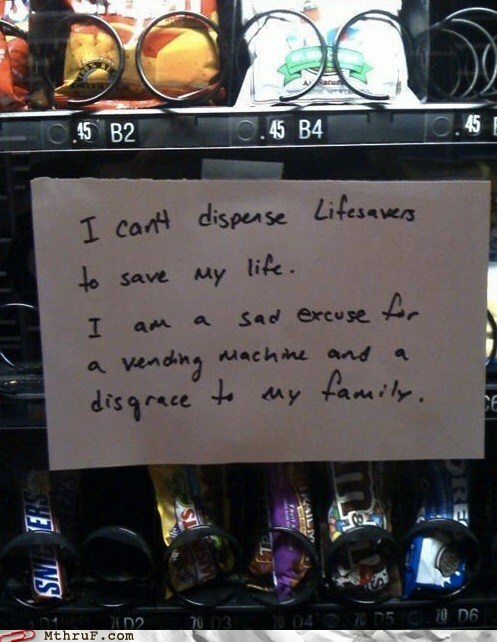 It might be a good bet that everyone who used vending machines has lost their money in one at least once. Sometimes the machine takes your money and gives you nothing in return. Sometimes the machine takes your money and does not give any change back. And sometimes the machine drops the wrong item and you are stuck with it. My biggest complain with vending machines is when you can see a row of the snack or candy items that you want and you know they are in there, but you put your money in and then it promptly rejects the money and you can’t buy what you want and there is nothing you can do about it. It’s not like it stole your money – it stole your hope!